This coming Sunday is the fourth Sunday of Great Lent, also known as the Sunday of Saint John of the Ladder (in reference to his most well-known work “The Ladder of Divine Ascent”). The Holy Church has allocated the fourth and fifth Sundays of lent to the Saints John Climacus and Mary of Egypt; two shining examples of the pillars of this holy season: fasting, prayer, and repentance. The celebration of St John on this day arose from the custom prevalent in the honorable monasteries of starting Great Lent with the reading of his book. 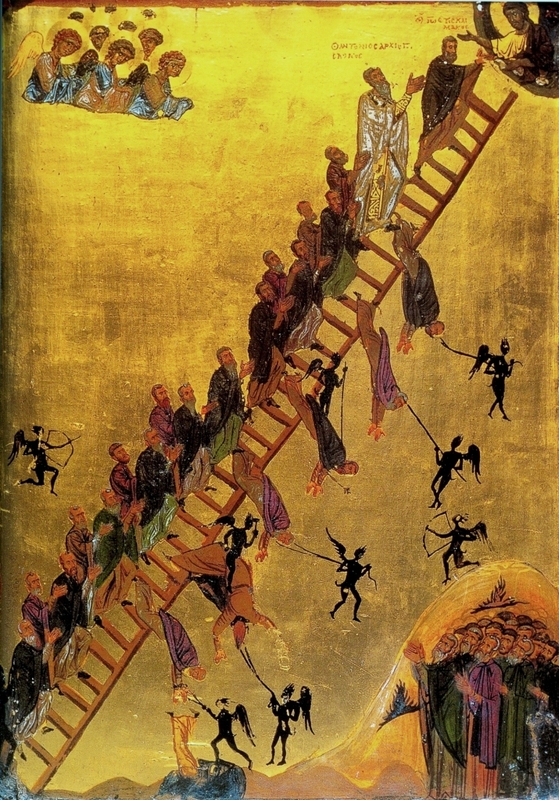 St John likens the method of elevating the soul to God to ascending a ladder. He teaches those who seek salvation how to lay a firm foundation for struggles, how to detect and fight every passion, how to avoid demonic snares, and how to rise from the rudimental virtues to the heights of Godlike love and humility. This incident was evidence of Satan’s existence. Satan or “evil spirit” are not just illusions or mere symbolic ideas, but a true being in existence. The Lord Jesus himself declared to the disciples: “I beheld Satan as lightning fall from heaven” (Luke 10:18). Jesus rebuked the “unclean spirit” within the boy, saying: “I command you to get out of him and not to interfere with him,” proving His dominion over evil spirits, which was one of the signs of the approaching Kingdom of Heaven. The Gospel says that when Jesus asked his disciples to bring the boy to him, and when he saw Him “immediately the spirit overcame him, and he fell on the ground, wallowing and frothing”. At that moment, the “wicked spirit” realised that he stood before the Lord of the Hosts with His glory and took to flopping; he realised that his end was close, and he acted as a predatory monster with a fatal injury, and by flopping about, he tried one final attempt to attack and hurt the boy. It seems clear that lack of faith was the reason why the Disciples were unable to cast out this “unclean spirit.” For this reason, the Lord Jesus tells the father of the boy, “If you can believe, everything is possible for the believer”. The attitude of the father is one of the most beautiful examples of humility and faith. He answered Christ with warm tears: “Lord, I believe; help thou mine unbelief”. With another word, he said: I believe, O Lord, but perhaps my faith has been shaken on some occasions by the horror of the trials and their difficulty, but thou strengthen my faith and shore it on the rock of confessing Thee. The Disciples asked their Master, “why couldn’t we get him out?” He said, “This kind can only come out with prayer and fasting.” It appears from this teaching that prayer and fasting are necessary conditions for overcoming the war against Satan, they are essential in spiritual life and faith and not as superfluous or added value to our spiritual struggles. Fasting and praying are not exclusive to monks and nuns, but to everyone, even though the way and level of practice differ between laypeople and monks. The Lord Jesus Himself fasted forty days before His trials and it is stated in the Gospels that He was always parting from the Apostles to pray (Luke 22:39) and (Mark 1:35). On the fourth Sunday of Great lent, having passed the halfway mark of this holy fast, the Church presents to us two powerful spiritual weapons to continue our journey towards perfection; namely fasting and prayer, also mentioned in the biblical reading. It also sets before us a role model and an example of virtue and asceticism to be emulated in our journey towards fulfillment in Christ, that is the commemoration of St. John of the Ladder, whom the Church praises by saying: “Let us honor John, that pride of ascetics, that angel on earth, that man of God in heaven, that adornment of the world, and that bliss of virtues and good deeds”. (Sunday Vespers).